Violence in Iraq surged in 2013 to its worst level in five years, fuelled by widespread discontent among the Sunni Arab minority and Syria’s civil war, figures released Wednesday showed. Bombs tore through markets, cafes, football fields and mosques, militants assaulted prisons, police stations and other government facilities, and families were killed in their homes. And while Iraqi security forces carried out widespread operations targeting militants, they have yet to curb the violence, and the mass arrests they sometimes make may ultimately contribute to the problem. Death tolls vary widely, but all point to a sharp rise in violence. 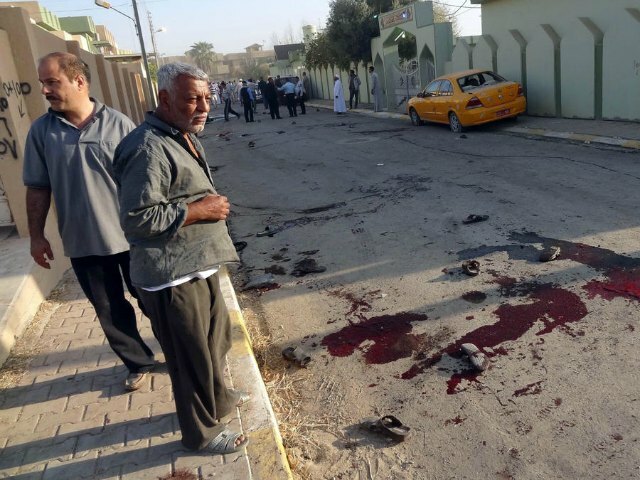 IBC said it recorded 9,475 civilian deaths in Iraq in 2013, compared to 10,130 in 2008, while Iraqi government figures indicated that 7,154 people died in 2013 violence, among them security forces and militants, while 8,995 were killed in 2008. Tolls for intervening years were much lower, sometimes less than half the 2013 figures. Over the course of the year, militants repeatedly targeted civilians, but were also able to strike targets that should have been highly secure. In July, for instance, militants carried out coordinated assaults on the Abu Ghraib and Taji prisons near Baghdad, freeing hundreds of inmates and leaving dozens of people dead. The year also saw a number of attacks on Iraqi journalists, with 12 killed in the last three months of 2013. Two main factors fuelled the sharp spike in violence, experts say. One is widespread discontent among Iraq’s minority Sunni Arab community, members of which say they are marginalised by the country’s Shiite-led government and unfairly targeted by heavy-handed security tactics. Sunni anger has made it easier for militant groups to recruit and operate while eroding the public’s cooperation with security forces. Anti-government protests broke out in Sunni-majority areas of Iraq at the end of 2012 and continued for over a year. On April 23, security forces moved on a protest site near the northern town of Hawijah, triggering clashes in which dozens died, sparking a wave of revenge attacks and sending death tolls soaring. On Monday, security forces tore down the country’s main anti-government protest camp, west of Baghdad. While clashes broke out in the area, the camp was ultimately removed without the level of violence seen during and after the Hawijah operation. The civil war in neighbouring Syria has also played a role, with the Islamic State of Iraq and the Levant (ISIL), an Al-Qaeda linked group, mounting attacks on both sides of the border.